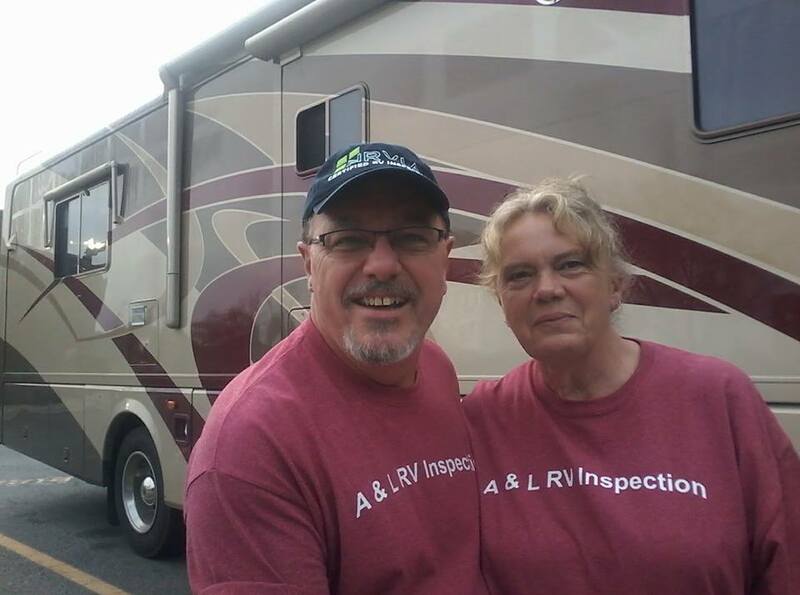 About Us | We provide RV Inspections so you can make an educated RV buying decision. 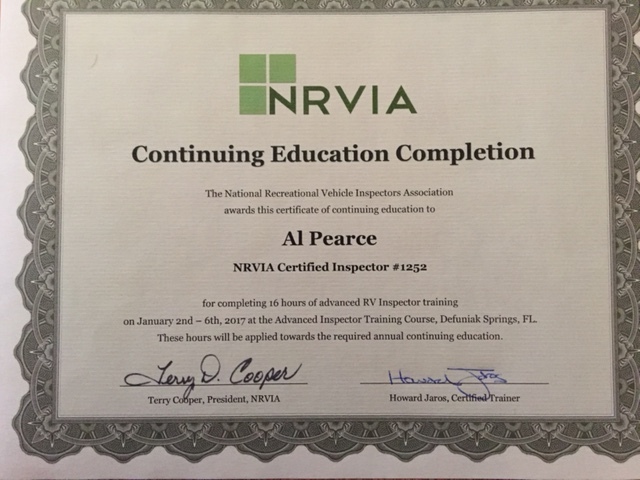 We have contact with other inspectors around the country and can assist you in finding an inspector anywhere in the U.S.A. We are in the Tampa, FL area and can perform RV inspections around the state of Florida. 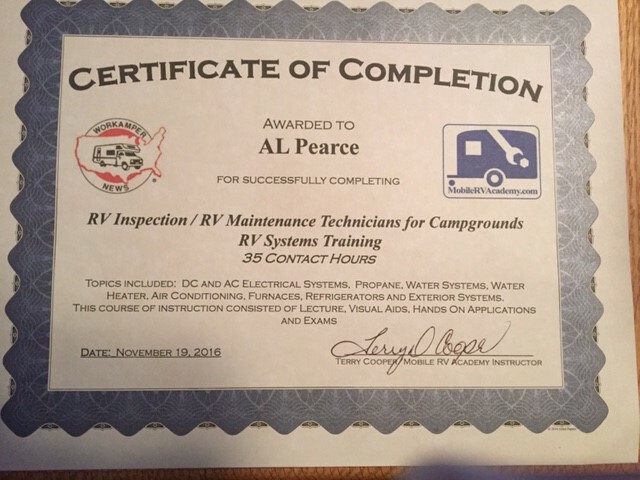 This page is intended to give you some background about us and why we should be your RV Inspection company or your Walk thru RV Inspector. Al spent most of his career in transportation, especially “expedited” transportation. Getting things done in a timely manner was always a priority. He has owned several businesses so he knows what it takes to satisfy a customer. Laura spent her career in Mental Health Services for the state of Oregon. She knows how important it is to be “attention to detail” Laura inspects the inside of RVs, takes pictures, records data and provides assistance to Al during inspections. We approach every RV Inspection as if we are going to purchase the RV ourselves. We believe we are the “eyes and ears” of our clients. Since over 85% of our clients are either “out of town” or “out of the country”. Yes we have performed inspections for clients in Australia, Brazil and Switzerland. They have never seen the RV until they either had it shipped overseas or arrived in America to purchase it. Our goal is to assist buyers of an RV, enabling them to make an informed buying decision. As small business owners, when you need an RV Inspection, we understand the urgency of your needs and will do whatever is possible to schedule an inspection request as soon as possible. 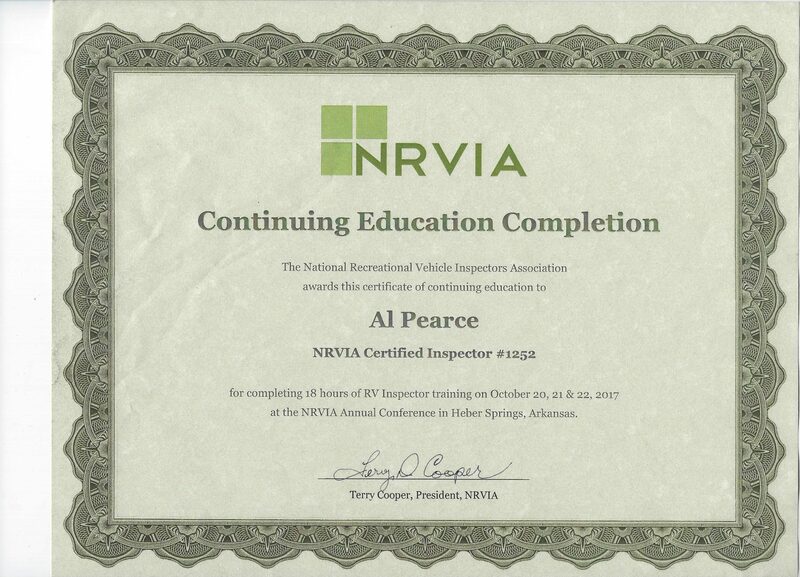 If we cannot meet your time frame, we can recommend another NRVIA “certified inspector” to perform the inspection. 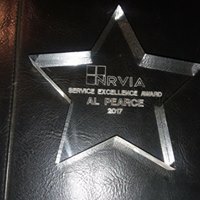 We strictly adhere to the NRVIA’s “Code of Ethics” in our inspection business. Once your inspection is completed, we will spend time reviewing, categorizing pictures and make some recommendations before we send you the report. We will then spend time with you going over the details of the report so you have a through understanding of any and all issues. Then you can make an educated buying decision of wether to purchase the RV or walk away. We hope you’ll give us the opportunity to service your RV Inspection needs. Please feel free to brose around our website to learn about the RV inspection process. We have a lot of information on the website to hopefully answer all of your questions, however, if you have any questions, please select the “contact us button”, type your question and we will get back to you right away. Where are you? I can’t find your location anywhere, yet you state the first 100 miles “round trip” are free! I am looking to invest in a used 5th wheel either via private sale or through a dealership. In doing so, I wanted to inquire about fees and scheduling. We live in the Huntsville, AL area and I am currently looking for RV’s within a 200 mile radius. How do I go about scheduling an inspection with your firm should I find a model I am truly interested in? I see that a 5th wheel inspection is $445.00, how much do you charge for travel if it is here in Huntsville, or maybe Chattanooga, TN? Thanks Kevin. Let us know when you locate the RV.